I haven’t written in a while. I’ve been working to be as fully present in the here & now as possible. It was a conscious choice to tuck the grief, the loss, the trauma of my dad’s suicide neatly into my back pocket. I needed to turn away from it, at least for a while. In Judaism, when you are in the period of shiva, the 7 days following the burial of a loved one, it is customary to cover all of the mirrors in your home. In the immediate days of grief, we are not supposed to focus on our external selves. Rather, we turn inward, we reflect, we dwell not on the details of our appearance, but on the memories and the life of the one we have lost. I didn’t observe that tradition while sitting shiva for my father. As a Reform Jew, it didn’t resonate for me. But there was another reason, a deeper one. In the moment that I learned of my father’s suicide, the person that I was shattered into a million pieces. The fragments lay seemingly sprawled in every corner. And how to even begin gathering them up seemed far too overwhelming a task. In the days that followed, I vacillated between feeling totally numb and sobbing uncontrollably. I lashed out in anger one moment, and then sadness swept in and overwhelmed me the next. There was no peace, no comfort, there was only a pain beyond words. I wandered through my home and my days feeling like a stranger in a strange land. Looking in the mirror was the only way to find some sense of the familiar. Even with swollen eyes, I found tangible evidence that while my inside felt broken beyond repair, some small sense of wholeness still existed. 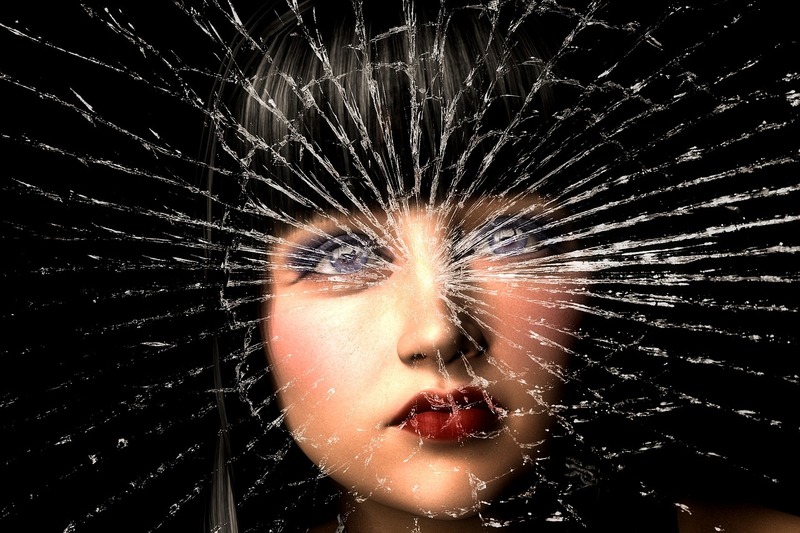 I gazed into the mirror and saw that I was still me… forever altered, but still me. I will tell you a truth. Almost 23 months later, I still feel broken. Yes, I have gathered up those fragments, and put myself together anew. But I often feel that if one were to look at me too closely, they would be able to see every fissure & every scar that I must now carry. Sometimes I avoid my own reflection, when it seems to contradict what I am feeling inside. It feels like a cruel mind game, looking whole yet feeling fractured. I tucked my loss away for a while. I laughed more, I found myself able to be more present for my children, my husband and myself. I read for pleasure, I made jewelry, I spent time with friends, I created in the kitchen and yes, I even needed time to heal from some physical challenges as well. And I haven’t thought much about my dad. Not because I don’t want to remember him, I do. But reflecting on my dad in life, seems to inevitably bring me to the way he died. That horrible, violent, darkness looms at the end of his story and it permeates each and every other chapter that I try to visit. So, like the mirror in a house of mourning, I draped those reflections off. I averted my gaze with intention. Because that felt a necessary part of my healing. Today begins the month of March. And looming ever so closely behind is the month of April. My mind has begun to go back to that place, of reliving his final weeks on this earth. I feel my body re-entering that fight or flight mode, the muscle memory of trauma. Creeping back into my psyche are all of the missed signs & the missed opportunities to try and save my father from himself. My rational mind knows there is nothing to be gained by that. But my soul still clamors for a different ending. My eyes still seek the hindsight of a more apparent truth, every fiber of my being yearns for another chance to know then, what I know now. And so it seems, I must take the covering off of the mirror. Not so I can focus on the external, but so I can reflect. I can’t continuously wall off the pain, there is not a wall strong enough to contain it forever. My soul is crying out to me, to feel the pain, the sorrow, the trauma and the loss & to tend to it with gentle honesty. And my heart, still so full of hurt, wants to make room to sort out the memories of my father’s life; the good & the bad, the laughter & the tears, the loss & the love. It’s almost two years. I simply can’t believe it. I miss him. I look into the mirror, and once again I feel exposed, vulnerable and wounded. But these days, I also see strength, resilience and courage. I have survived, I am still surviving. And I am finding ways to thrive. The mirror beckons, asking that I find a way to let these two truths co-exist. My father died by suicide. And I must live with that. But our story deserves to stand in the light; all of it… because without that, I lose him all over again. How do I find a way to let the reflection hold both of these pieces? I look in the mirror now. I see a daughter who loved her father. I see how much she misses him. Perhaps, if I close my eyes, and let the wall come down, I’ll be able to find my father gazing back at me. And through our tears, we can smile and for a moment, be together. “Uncovering the Mirror” was originally written by Deborah Greene for Reflecting Out Loud, where she writes about family and suicide. If you would like to read more from Deborah, head on over there and grab some of her wisdom and insight of life after her father’s suicide. Thank you for taking the time to write such a beautiful piece. That was so beautiful, I got the chills. I am so sorry for your loss. The metaphors in this piece are so poignant. May God bless you and give you peace. Deborah thank you so much for writing such a beautiful piece. I have been following your journey and I understand your feelings. You see my husband died by suicide a week after your father. He had been fighting depression and anxiety along with other physical problems for 11 1/2 years. In the last two months I could see him getting worse. In my mind, I thought I was going to lose him because of a heart attack or stroke. I was kind of prepared for that. I was not prepared for this. NEVER did I think he would do this. I think this is why I am having such a hard time trying to move forward. The one emotion I have not felt through all of this is anger. I guess it’s because I watched how he suffered and deteriorated. My husband was a very strong man and a very hard worker. He was constantly doing or fixing something for someone. In the end he could no longer feed himself or shave himself because he shook so much. He was always a very proud man and was constantly apologizing to me for putting our family through his illness. As much as I am hurting, I can not be angry with him for shattering our lives. The hardest part for me in all of this was telling my daughter and son. My son is a police officer. He lived at home with us at the time but he was not at home that evening. Even though he has dealt with suicides before he was not prepared for this. He is more hurt than anything. He looked up to his dad so much. My daughter was 6 months pregnant with our first grandchild. She is angry with him and I understand and it’s ok. He seemed so happy when she told us that she was going to have a baby. My husband was afraid that he wasn’t going to be a good grandfather. He was afraid that he wouldn’t get to hold the baby because of they way he shook. Oh how I wish he could of held her. Addie is 19 months old now. She has brought so much joy to all of our lives when we didn’t think it was possible. God has a way of easing our pain. I just want to say thank you for everything you have written. I understand all the feelings that you are feeling. Like you, I am not looking forward to April coming. I find my self going back to everything that happened over and over again. I try blocking it from my mind but it has a way of creeping back in. But like everything else I will survive the second anniversary as well. I hope in time that you find peace and the pain eases. May God Bless! I’m so grateful to all of you for meeting my words and emotions with so much grace, compassion, empathy and support. And your willingness to open up to me in turn, exposing your grief, pain and sadness, allows me to feel less alone & more understood on this journey, ironic given that in every other way we are strangers. But in our shared loss, there is a knowing… and I am grateful for that. Wishing you all comfort, continued healing and some semblance of peace. Thank you for such a beautifully written piece of your thoughts and emotions. Beautifully written. Will be three years for me in mid-May since losing my sister to suicide. The part about the good memories particularly resonated with me about bringing me back to “that day”. Slowly the memory of “that day” is losing some of it’s impact, though can still sneak up without warning. Like covered mirrors, I still have not been able to display photos of my beautiful sister. Thank you, and may we all continue in our healing journeys. Thank you Deborah for sharing you pain, healing and grief journey with us. I could identify with so much of what you wrote. My dear older brother, Bruce, died by suicide 5 yrs ago this June 7th. My life was changed forever, and my heart & soul were ripped to pieces for 3-4 yrs. It is still broken , and always will be. I am so incredibly grateful that we, as survivors can help each other with our hearts and souls to heal.<3. God bless you. I so related to the mirrors. I lost my son to suicide and it will be two years June 1st. Thank you for putting your thoughts and feelings out there so we could feel that we are not alone. I try to journal but have a hard time expressing myself on paper let alone verbally. When I read something that I can relate to, it is so therapeutic for me. Thank you for sharing.